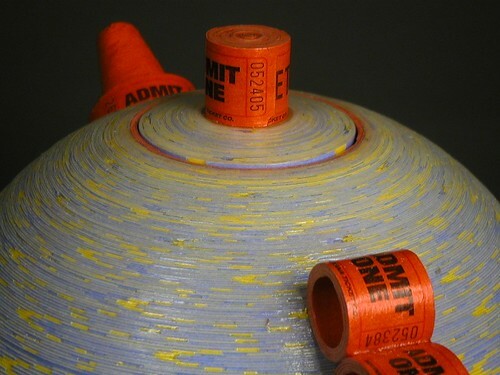 Sculpture artist Brian Jewett is drawn to alternative uses of ordinary materials. 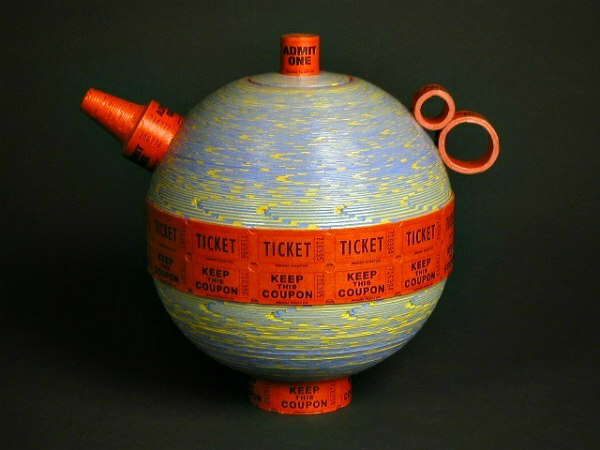 He created this whimsical paper teapot by shaping and sealing multiple rolls of those ubiquitous tickets we've all seen a million times. See additional beautifully sculpted pieces in Brian's Admit One repurposed ticket series... there are interesting jars, bowls, and vases. He has also created lamps and baskets using unique items...cable ties, garden hoses, and vinyl tubes for example, along with a series of very cool film bowls. As you might have guessed, Brian has a manufacturing background - machinist, tool maker, and mechanical designer. Brian was commissioned to create the Admit One teapot by Sonny & Gloria Kamm who have amassed an extraordinary collection of teapots since 1985. You might enjoy this Los Angeles Times article, Sculpture with a Spout, that describes the origin of the collection. I think the film bowls are awesome. How nice also to show the material from which they have been made on the edges of the bowls. If not for that I would not have guessed from what these beautiful bowls were sculpted from. 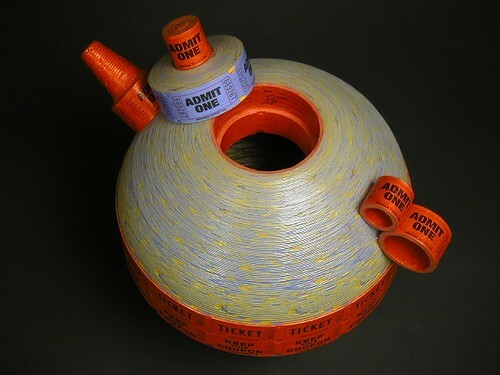 Love the film bowls! Jewett's baskets are wonderful, too. wow this is awesome, talk about time consumming!!! what a neat teapot that is. These are awesome! Loved reading his website and seeing the other things. I asked my husband, 'why can't you do this'? LOL Will check out your Friday finds over the weekend! Thank you for showing us Brian Jewett's work, I loved his page. This teapot is just wonderful. Wow. Love his creative process explanation! The ticket series is definitely inspiring...but, the film series has the WOW factor! Hope the owners of those pieces appreciate them - what a treasure! Brian's artpieces are just magnificent!!! I never tire of seeing such artpieces!